Meet Your Entomologist, Dr. El Damir, B.C.E. Dr. El Damir, B.C.E., is an Entomologist with research, commercial, technical, outreach, and academic experiences in pest management and entomology-related work. He completed his Ph.D. from the University of Vermont (UVM) specializing in Entomology. Dr. El Damir also is a Board Certified Entomologist, or B.C.E. - from the Entomological Society of America (ESA). 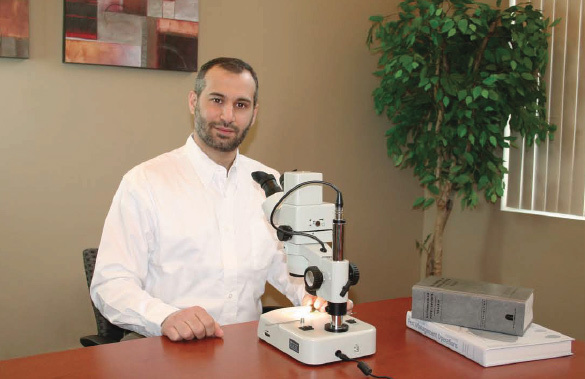 Besides his well-versed skills in the Integrated Pest Management (IPM) techniques, Dr. El Damir has been in the structural pest control industry since 2006. Currently, Dr. El Damir works as the technical and training director for Adam's Pest Control, Inc. His duties include developing written field pest management procedures and providing identification of insects and other arthropods for company technicians and the public. He provides training to company personnel, speaks at trade conferences, and is part of planning committee for a state re-licensing conference. He developed procedures for eradicating bed bugs from private and commercial properties. He has been appointed as a board member in the commercial division of the National Pest Management Association for five consecutive years, and is on the Board of Directors of the Minnesota Pest Management Association. In addition, he is a member of the Minnesota Bed Bug Advisory committee. Call today for a professional entomology solution tailored for your business.